Why is the Miller™ Dowel better than a straight (pin) dowel? The most significant difference is what we call the "capping effect" of the head of the Miller Dowel. What this means is that the only shoulder along the length of a Miller Dowel that seats when inserted is the topmost section. The force of your mallet drives the Miller Dowel down into the pilot hole until the top section seats, forcing the top board down against the substrate. This clamping pressure is so effective that the work piece no longer needs to be clamped, and the chance of a bridge forming between the two components is nearly impossible. The stepped design also makes the Miller Dowel much easier to insert. Once the pilot hole is drilled, our dowel will drop in until each section of the shank rests on the top of its appropriate hole (which is at the very top for a pin dowel). This also means that the Miller Dowel is self-centering and will self-align components that are allowed to "float." Adhesives should be used just as they are with traditional pin dowels. However, the ribbed design of the Miller Dowel provides for increased glue coverage over the entire length of the dowel, as well as adding to the overall surface area, and allowing for pressure relief. These ribs also expose some end grain to the glue, which will cause the hardwood to swell for a tighter fit, and will absorb more adhesive for improved bonding performance. We recommend using good quality wood glue (PVA), but epoxy and polyurethanes also work very well. Is it as strong as a metal fastener? The Miller Dowel has a lateral resistance strength that compares favorably to that of a nail or screw. 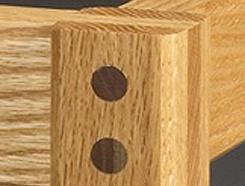 As with other glued dowels, the resulting joint is stronger than the wood itself. Toenailing (inserting two fasteners at opposing angles) and the use of a quality wood adhesive will increase the strength of the joint. What types of wood do you offer? Birch is our standard Miller Dowel, which is included in our Miller Dowel Joinery Kit along with an appropriate-sized TruFit Drill bit. Red Oak, Cherry, and Walnut are also available in packages of 40, 100, and 500. We intend to offer a number of domestic and tropical species of weather- and decay-resistant hardwoods in the near future. Some of the species we will offer include black locust, ipe, mahogany, teak, purple heart, and several others. Can you use the Miller Dowel in plywood? 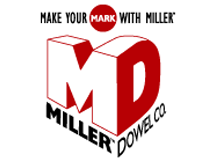 The Miller Dowel is excellent for use in most laminates such as plywood, chipboard, and MDF. The performance in MDF is outstanding. 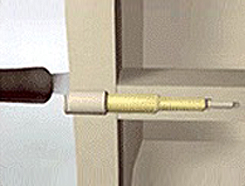 Unlike a screw, which pulverizes fiberboard, the Miller Dowel is inserted into a pilot hole that provides an absorbent surface for glue and dowel to adhere to. The resulting joint is stable and strong. We have three standard sizes, the Mini-X, the 1X, and the 2X for appropriate board thicknesses. The Mini-X was designed for board stock, while the 1X is primarily for thick wood. The 2X is intended to be used with larger stock. 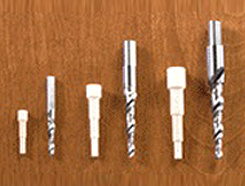 All of our sizes have some latitude in what thickness of wood is used because you may drill your pilot hole short of flush, and simply remove the exposed portion of the cap. As long as the bottom shoulder of the cap section is somewhere in the middle of your top board, you will take advantage of all of the performance features of our patented product. How does the Miller Dowel work when staining or varnishing wood? After insertion, you may choose to cut or sand the exposed portion of the head to create a seamless fastener. Nothing could be easier to finish. Also, when it comes time to refinish, the entire piece can be sanded as there are no metal fasteners or plugs to be concerned about. Why not just use a screw or a nail? Metal fasteners attract moisture through condensation, eventually degrading the wood in which they reside, causing the joint to be compromised. Screws and nails have a higher specific gravity than the surrounding wood. When wood moves due to stress, changes in relative humidity, or vibration, the screw will compress the wood around it, causing the hole to enlarge. This is one reason why in furniture made with screws, you must tighten the screws to reseat them after a period of adjustment in your home. Wooden fasteners are clearly safer than their metal equivalents. Injuries caused by nail-pops or splintering from countersunk screws are eliminated through the use of Miller Dowels. Exposed metal fasteners are generally considered unsightly. It is for this reason that carpenters often take an extra step to insert a plug, which takes more time and frequently needs to be re-glued in order to stay put. Finally, even a high-grade stainless steel screw or nail does not agree with wood as well as a wooden fastener does. Cracks can originate from a metal fastener in a deck plank after a single year. Yet, Amish barns constructed with pegs and untreated wood continue to survive year after year. Wood joins better with wood fasteners. Can you sharpen the TruFit Drill Bit? It is possible to sharpen the TruFit Drill bit by hand or with a sophisticated grinding machine. The tip may be sharpened with a widely available Drill Doctor sharpener. Because the relationship between the pilot hole and the Miller Dowel is so crucial, we do not recommend sharpening the drill bit more than once or twice. Our TruFit Drill bit is made from industrial strength high-speed steel to tolerances of .002". They are quality tools, which should provide a long service life before sharpening or replacement. How do I replace my defective 1X TruFit Drill Bit? It has come to our attention that a small number of our Miller TruFit Drill Bits were ground improperly, causing the topmost section and/or the second section to cut poorly, or not at all. If you have experienced this problem with your 1X drill bit, please call our toll-free number at (866) 966-3734 for a free replacement drill bit.